$161.00 includes all class-related handouts and materials including the 500+ page Master Gardener manual. Class size is limited and registration is required to reserve a place in the class. Class will be held every Tuesday from January 29th to May 7th. (See the detailed schedule). Attendance at the weekly training sessions is necessary for success in the course. A passing grade on the final exam is required to become a Purdue Master Gardener Intern. 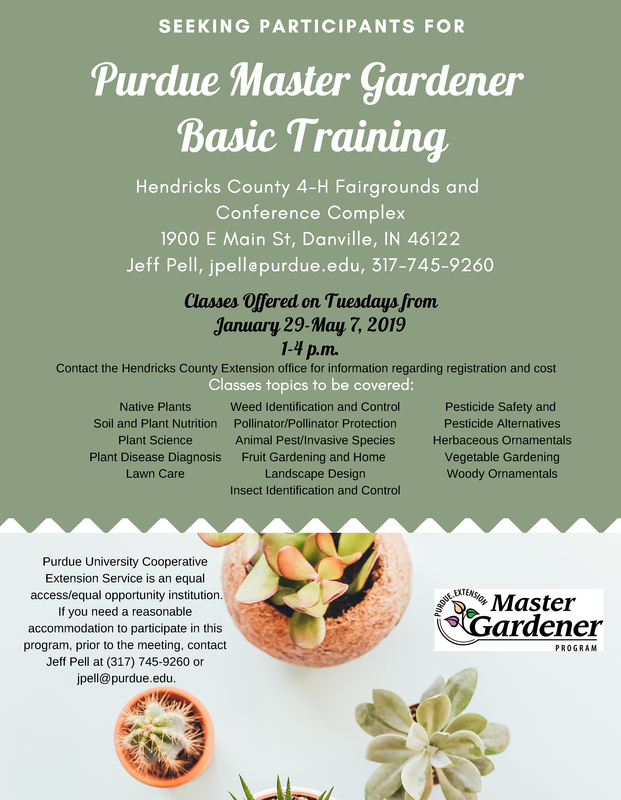 After logging 35 volunteer hours within two years, you will be certified as Purdue Master Gardener. Certification is renewed annually with 12 volunteer hours and 6 education hours. The first step to registering for the class is completing the Master Gardener Volunteer Agreement. (Download the agreement). Please complete the application and return it to the Hendricks County Extension Office. The Extension will then complete your registration with payment. For more information or questions contact the Hendricks County Extension Office.